Anytime there are world wide organized demonstrations urging action on global warming/climate change, my first question is who funds them and who really benefits. From seabeds to mountaintops, people around the world were staging a day of demonstrations Saturday to call for urgent action on climate change. So if you guessed the name Rockefeller as the major known backer of 350.org, you would be correct. 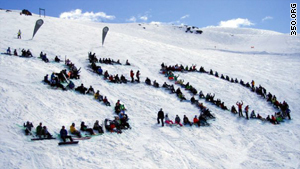 '350' is a subsidiary of the Sustainable Markets Foundation, an offshoot of The Rockefeller Brothers Fund. In 2006, David Rockefeller Sr. made a $225 million bequest to the Rockefeller Brothers Fund, a foundation he formed with his four siblings. This is the same David Rockefeller whose quotes have been well publicized and have exposed his agenda. Question: Where are you at the antiwar rallies? The pentagon is the largest polluter on the planet. "A new era for the nuclear industry"
I don't really see anywhere on ANy of the links you posted a connection between 350 and Rockefeller. Could you supply me with some better links or point to me where I can read about the substantives to 350 by Rockefeller foundation? Very informative article, thanks for posting. Indeed the ultra-rich and ultra-corrupt have taken over the environmental movement and turned it into an anti-human movement. I have no reason to doubt the article - just one question; where did you find all the grants listed above? At the RBF-site I can find only three "related" grants. Seems like I just didn't know where to look exactly... thanks! I'm messaging you because I love what you do and I want to put you in print. We are creating a monumental new print outlet. The time has come to get content of substance into a large scale print publication. I want work of your caliber and integrity to be represented within our paper and projected into the mainstream consciousness. The Agora is a new newspaper that creates a platform for everyone to use, enabling people to voice opinions, share ideas, debate, and disseminate information. Our content is almost entirely user generated and we will never censor an article due to the topic. The articles must be well written, thought provoking, and documented if necessary. If your piece meets these simple requirements it will make it into print, reaching tens of thousands of people. Our launch date is set for a week or two from now in Vancouver. We are publishing 10,000 copies for this first issue, to be distributed all over Vancouver at high traffic locations. It will begin as a bi-weekly publication, growing in scope with each subsequent issue until it is National. The plan is well laid and progressing rapidly. If you would like to see your work read on a large scale, help us get the ball rolling. Savvy truth spewers like yourself are needed, and specifically desired by moi, to fulfill the ultimate vision of this project. You would retain total rights to your work, your column is under your complete discretion and can be used to generate high volume traffic to your own site. Please check out the beta site for a more thorough explanation of it all. Anyone who does't believe what these people are telling you to your face about their agenda is nuts.. They are TELLING YOU IT'S A HOAX! "Isn't the only hope for the planet that the industrialized civilizations collapse? Isn't it our responsibility to bring that about?" Is equality a ‘nightmare’ for liberal Zionists? Another 147 people dead in Baghdad, cui bono?